"This remarkable volume is superb. Berlin's great powers of observation combine with his great knowledge and literary gifts to provide us with a fascinating series of insghts... Even a reader who is only casually interested in the history of Russia will be fascinated. Every day the media present us with lumps of coal, and to find a real diamond is a delight." lunch. It would have been fun to have Sir Isaiah in our midst, not least because fun was yet another ingredient of life – including the life of the mind – that he both dispensed and appreciated in others. His stepson, Peter Halban, recalls Berlin teaching him to play a Russian version of tiddlywinks. He loved wordplay, storytelling and gossip. His commentary on the human condition was often freewheeling and playful. Berlin would have spent some time in the library on the third floor as well. He believed that ideas, like civilisations, States and individuals, owe much to their forebears. Those ideas live on in books. He called himself not a philosopher but a historian of ideas. He saw himself not so much as a promulgator of new truths as a student, critic, synthesiser and explicator of old ones. He put a premium on scholarship – on analysing the empirical evidence, pondering work others had done before him, and mastering its implications for their time and our own. townspeople or a nation – encourages different and often competing ideas of what is good, true and right. The last time I met Berlin was in 1994, a little over two years before his death. I was serving in the State Department at the time and gave a lecture in Oxford on the promotion of democracy as an objective of American foreign policy. It was unnerving to look down from the lectern and see him there, in the front row, fully gowned, eyes riveted on me, brows arched. After I finished, he came up to me and, along with several courtesies, offered his favourite piece of advice from someone who was not, I suspect, his favourite statesman: Talleyrand. ‘Surtout pas trop de zèle,’ he said. I had the impression that he was not so much reproving me as letting me in on what he felt was a home truth about pretty much everything American, notably including our foreign policy. What he called ‘the unavoidability of conflicting ends’ was the ‘only truth which I have ever found out for myself’. ‘Some of the Great Goods cannot live together . . . We are doomed to choose, and every choice may entail an irreparable loss.’ It’s a kind of corollary to his concept of pluralism, and of liberalism. Thus, for him, all interesting issues are dilemmas. The only thing worse than making a mistake was thinking you couldn’t make one. He believed we must face the inevitability of undesirable, potentially hazardous consequences even if we make what we are convinced is the right choice. Had Berlin taken the matter that far and no further, he would have left all of us – including those of us in the think-tank business – in a cul-de-sac, a state of ethical and intellectual paralysis, not to mention chronic indecision. But he did not leave us there. He argued that the difficulty of choice does not free us from the necessity of choice. Recognising a dilemma is no excuse for equivocation, indecision or inaction. We must weigh the pros and cons and decide what to do. If we don’t, others will decide, and the ones who do so may well act on the basis of one pernicious ism or another. All in all, the making of choices, especially hard ones, is, he believed, an essential part of ‘what it means to be human’. Perhaps the best-known phrase associated with Berlin’s view of the world and humanity is the one used as the title for his essay, The Hedgehog and the Fox. It comes from a fragment of Greek poetry by Archilochus: ‘The fox knows many things, but the hedgehog knows one big thing.’ As he applied this saying to the major actors of history, Berlin was not praising one beast and condemning the other. Everyone combines both, although in different proportions and interactions. In that sense, the proverb doesn’t quite work as a bumper-sticker for life – which is appropriate, since Berlin was wary of slogans and nostrums. He did, however, have one big idea of his own – his own personal hedgehog – and it was (also appropriately) paradoxical: beware of big ideas, especially when they fall into the hands of political leaders. 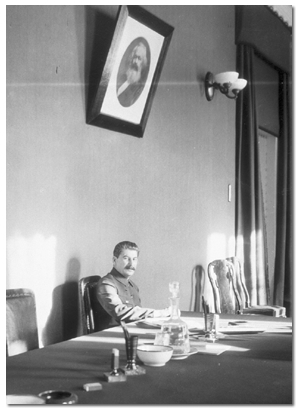 The American photojournalist James Abbe scored a rare publishing coup in 1932 by talking his way into the Kremlin for a private photo-session with Stalin. The results included this rare personal shot of the Soviet leader, at a time when he was becoming increasingly reclusive. of whom shows him sitting beneath a portrait of that Big-Idea-monger, Karl Marx. Stalin looms in the background, and sometimes the foreground, of all Berlin’s essays on Soviet politics and culture, including those written after the tyrant’s death in 1953. 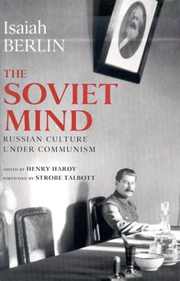 Soviet, un-Soviet and anti-Soviet – that informed what he thought and what you are about to read. at the time, and wrote a visionary dispatch to the Foreign Office in London. It expressed a hope that the vitality and magnificence of Russian culture might withstand, and eventually even overcome, what he called the ‘blunders, absurdities, crimes and disasters’ perpetrated by a ‘most hateful despotism’; in other words, that the best in Russia’s dualism might win out over the worst. unlikely . . . Beset by difficulties and perils as this monstrous machine may be, its success and capacity for survival must not be underestimated. Its future may be uncertain, even precarious; it may blunder and suffer shipwreck or change gradually or catastrophically, but it is not, until men’s better natures assert themselves, necessarily doomed. Berlin did not believe in certainty – especially, to paraphrase Yogi Berra, about the future. I interviewed Berlin in the summer of 1968, just after Soviet tanks overran Czechoslovakia and crushed the Prague Spring. He talked, at breakneck speed and in a baroque, erudite manner, but with great clarity, about how the invasion proved the weakness of a regime that relied so utterly on brute strength, and how it revealed the ‘decrepitude’ of the Soviet system and of its ideology. Yet he – like myself and virtually everyone else I knew – still expected that system to hang on for a long time to come. In the mid-1980s, Margaret Thatcher chided Berlin for being a pessimist when he suggested that it would take a war to bring about what now would be called ‘regime change’ in Moscow. Even in the Year of Miracles, 1989 – when the wall (literally and figuratively) came tumbling down – while others saw the end of history, Berlin was not ready to pronounce the end of anything. In‘The Survival of the Russian Intelligentsia’ he hails the Russians for their part in the peaceful revolution that was spreading throughout the Soviet bloc. They are, he wrote, ‘a great people, their creative powers are immense, and once they are set free there is no telling what they may give to the world’. He believed that history, including the history of ideas, is always‘in progress’. At moments when the direction seems positive, progress can be acknowledged, even celebrated – but without excessive zeal, or certainty. This much can be said with total certainty: to be associated with the publication of this book is a cause for all of us to be more than reasonably proud. * Reprinted from "The Soviet Mind: Russian Culture under Communism" (Brookings Institution Press, 2011) by Isaiah Berlin. Foreword © Strobe Talbott 2004. Strobe Talbott is president of the Brookings Institution. He is the author of several books on Russia and the Soviet Union. Letter to Jean Floud, 5 July 1968; cited by Michael Ignatieff in Isaiah Berlin: A Life (London and New York, 1998), p. 246. ‘The Pursuit of the Ideal’, in The Crooked Timber of Humanity, ed. Henry Hardy (London, 1990), p. 13.